Wallet-friendly rates complimentary Wi-Fi and in-room microwaves and mini-fridges await budget-conscious travelers at the Navajo Lodge. The two-story Navajo Lodge hosts 27 rooms all of which feature free Wi-Fi cable TV with HBO mini-fridges and microwaves. Non-smoking rooms can be requested. The 24-hour front desk is a boon for guests arriving late. Road warriors are happy to know that copy and fax services are available on-site. Pets are permitted for an additional fee and parking is free. 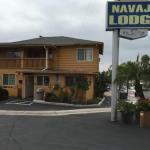 The Navajo Lodge is within a mile of both Platt College and Colina Park Golf Course. The San Diego Zoo is six miles away the University of San Diego is 10 miles and SeaWorld is 12 miles. San Diego International Airport is a 12-mile drive.